The Apollo 9 mission came closest to the moon and made sure all systems were ready for a moon landing. To return to earth, the astronauts were contained in a small capsule that landed in the ocean. There they bounced around on the waves until rescue. This art quilt captures the vastness of the ocean where the capsule floated, and the arrival of the rescue helicopters. Hand made chenille fabric. Thread-painting techniques. Applique. 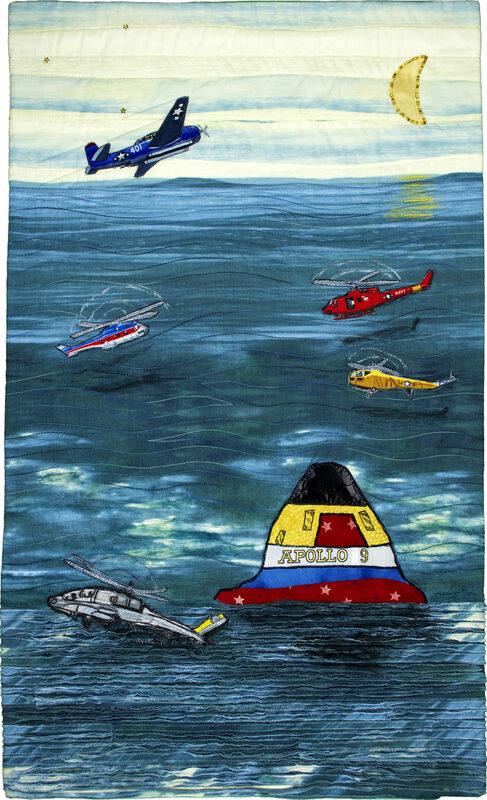 Needle-felted fibers represent the mist and spray produced by the helicopter blades.